When I first moved to Seattle, I looked for ways to find a place in my new neighborhood. 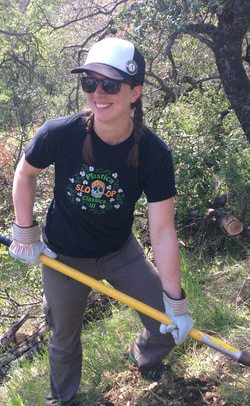 I wanted an opportunity to meet and connect with my neighbors in a meaningful and important way and have a hand in helping restore forests in the middle of a very urban place. I want to be the person who helps others get to the point where they care and want to protect those spaces around them. Kinnear Park is a hidden gem that is used by a lot of pedestrian commuters. Each day, the park has the opportunity to provide stress relief, a sense of “awe,” and exposure to plant and wildlife communities to these people. The park users can see the real effects of restoration when they see it each day. When wildlife returns or native plants re-establish, they will be the ones to notice and appreciate the effect. I believe that visually seeing the difference that restoration makes can inspire more people to be involved or support the efforts. Seeing progress is the coolest part of being a forest steward! It’s pretty inspiring what a few people over the course of this last year have accomplished. Neighbors have donated time to pulling Himalayan blackberry, English ivy and Clematis and planting new native plants — the hard work pays off and the difference is incredible. The next 10 years and beyond? I would love to see more community events that connect the neighborhood to the value of the park. It would be great to use the pathways for educational nature walks and events that teach youth and families the functions and values of city greenspaces and inspire future protection. The value of a forested parkland goes beyond the park itself. Even the smallest greenspace can have positive impacts on water quality, wildlife needs, and human well-being throughout the city. I think it’s inspiring to know that even when we live in a huge urban hub like Seattle, greenspaces and urban forests can improve life all around. Love this park? Happy Hour Restorations are coming up in July and August. Find the next event on the GSP calendar.